She came from the stars to many tribes, though each knew her by a different name. Two young Sioux braves first saw her walking barefoot across the plains, a beautiful maiden adorned in white buckskin, with an eagle feather in her hair. Taken aback by her great beauty, one of the braves expressed his desire to lie with her in the tall prairie grass. The other spoke, "This is a sacred woman, a vision perhaps, not one to be approached in this manner." To his surprise the woman smiled at the lusty warrior and said, "Come to me. You shall have what you desire." "A man who looks first to a woman's outer beauty will never know her beauty divine, for there is dust upon his eyes and he is blind. But a man who sees in a woman the spirit of the Great One and sees her beauty first in spirit and truth, that man will know God in that woman. You were not blind to my beauty but your first thoughts were, "Who is this woman, what makes her face glow in the afternoon sun, what thoughts dance behind her flashing eyes, from what land does she come?" "Have no fear, you too shall have what you desire. You and your friend symbolize the two paths that men can take. If first you seek the Great Spirit, you will find that what you need from the earth will come readily into your hands. But if you first seek to secure your earthly desires and forget the spirit, you will die inside." "I am the Spirit of Truth and the face of the Great Spirit your people have forgotten. Tell your chief to prepare a camp tonight that I may come to your people, to teach them sacred things that once they knew but no longer remember." The brave hurried to his tribe and the chief, after listening carefully, built the camp as she requested, convinced his people would receive teachings from one who lived amongst the stars. That night, as she approached their camp, the people were amazed at how young she was. Without speaking a word, she walked seven times around the central fire; as her feet touched the sand, all who watched felt her prayerful reverence for the Earth. Few could look into her eyes. Those who dared saw pools of perfect blackness and saw themselves as they really were, naked and revealed. When she spoke at last, her voice was like the song of waters singing upon the rocks, like the song of birds calling above the meadows. Seven times I have circled this fire in reverence and in silence for it symbolizes the love that burns forever in the heart of the Great Spirit. The same fire that warms the heart of every buffalo, every sage hen, every eagle and every human being. This fire that burns at your center is your love, and it is right, at times, to express this love sexually. This passion, if uncontrolled, roars like a wildfire and can destroy everything in its path. If tempered with wisdom, this same passion can fuel whole generations, warming a thousand lodges through a hundred snowy winters and give its power to your children's children. Those, like the young man whose bones now lie underneath the moonlight, who think first of the sexual expression of this fire and only secondly of the spirit behind it, lock themselves into cycles of suffering and illusion. These cycles were unknown to you years ago, but now weaken your vitality and drain away your power. 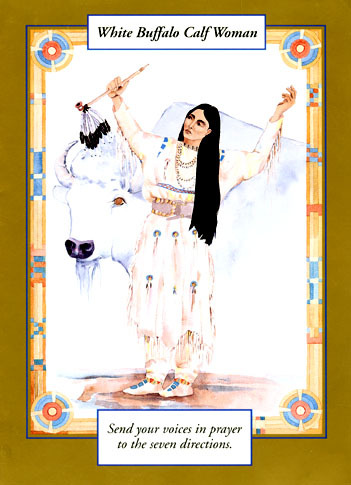 White Buffalo Calf Woman then taught them to harness the power of this creative force and reminded the people of the Sacred Hoop and how to gather power and focus it within its circle of commitment. In the warm atmosphere of that circle, the power of love builds like a storm until suddenly the circle can hold no more and explodes in the conception of the new. She pulled a burning branch from the flames and spoke, "My tribe is the Fire Bird, we are the Winged Ones of Heaven. Your people have forgotten the most precious thing, your connection to the Great Spirit. I have come with a fire from heaven to kindle again your memory of what has been and to strengthen you for the times to come." She drew a pouch from her side and took from it a sacred pipe. The bowl was round and of red stone; red for the pathway of the Sun. It represented the circle of the Sacred Hoop, the cycles of giving and receiving, of inbreathing and outbreathing, of living and dying ... White Buffalo Calf Woman filled it with the finest tobacco and in that simple act, honored all the plant world. She held the pipe aloft and addressed the people, "This pipe will help you remember that every breath you take is sacred. Your life is lit from that same fire that burns in the heart of the Great Spirit. Your flame, your individual human life, can light a greater fire ... the flame of love in another's heart and so bring consciousness to the Earth. Keep not the love that burns within you turned towards your self and your desires but give away that fire, that it may burn bright in the helping of each other." The pipe was passed seven times; the first smoke honored the people's highest thoughts, prayers and aspirations and was a breath of gratitude to the Great Spirit. The twelve eagle feathers hanging from the stem of the pipe allowed the tribe's thoughts to fly high above the world of their little selves. The tribe was instructed to remember always that every living creature was a sacred being and to know this especially while mixing with other tribes whose ways were different from their own. "Honor all creatures as your sisters and your brothers for all are sacred parts in the body of the Great Spirit. Each one is holy. Live your life in harmony with the way of balance and you will know peace and joy. If ever your hearts should feel heavy within you then smoke a fifth time, asking for the guidance of the great beings of the spirit world. Ask that spirit to help you make the clearest choice. In time you will come to know that spirit as your own true self. When you invite spirit into your life, you help yourself far more than if only concerned with your own affairs. Human beings are not fully happy or healthy until they serve the purpose for which God created them." White Buffalo Calf Woman then explained how the sixth smoke was sent to the six people whom you would most like to see especially blessed. The seventh smoke must always be taken in silence; for it was offered to the Great Being from which all others sprang. For that sacred mystery at the source of life, it was better, she said, to have no words. After the seventh smoke was completed, such a unity was felt by those present in the great teepee, it seemed in that moment as if there was but one present. In perfect stillness, the silence spread like warm water, dissolving the last traces of disharmony from the heart of the Sioux.